The ski season is getting closer. Lift tickets are now on sale and accommodation is filling up fast. Whether you’re travelling with friends or family, the easiest way to get to most ski resorts in Australia is by road. So pick up a hire campervan and enjoy the road trip to the perfect winter holiday! As most Australian ski resorts are located within national parks, there’s often entry fees based on how long you’re staying within the park. These fees usually include parking, but check your resort’s website. Don’t forget to buy or hire a set of snow chains. Perisher is the largest complex in Australia, covering four different resorts (Perisher, Blue Cow, Smiggin Holes, and Guthega). Lift passes cover access to all four resorts. There’s no overnight parking on the ski fields – park at Bullocks Flat and take the Skitube up to the snow. If you’re staying in Jindabyne instead, you can either drive to the Skitube terminal each day or drive up to the snow and use the free day parking. 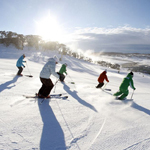 Thredbo has the longest ski runs and steepest overall terrain in Australia. The resort itself is modelled on a European skiing town with a strong nightlife culture. As natural snowfall is less reliable here due to lower elevation, the resort has heavily invested in snowmaking systems. Parking is free at Friday Flat, from where you can catch the free shuttle bus to most lodges. Mount Buller has the largest accommodation and lift capacities of Victoria’s ski resorts, and is also home to the National Alpine Museum. Visitor parking during winter is limited to a parking lot below the snow line. From here you can either catch the free shuttle bus or a 4WD taxi to the village. Within the village there’s a free shuttle bus. Falls Creek is very beginner/intermediate friendly, in a beautiful alpine forest. Unlike many other resorts, most of Falls Creek accommodation is ski-in ski-out, so you can get on and off the ski fields without carrying your skis for long distances or waiting around for the shuttle bus. Parking is located outside of the village, with a free shuttle service to your accommodation. Mount Hotham is the highest resort in Victoria (second highest in Australia) and is famous for its steep slopes. As it’s the most consistently cold resort in Australia and boasts the highest rainfall, the snow is consistent. Day parking is available in the village. If you’re staying overnight you’ll have to park in the allocated area outside the village and use the resort’s free shuttle service to reach your accommodation. So take your pick of resorts, book your campervan hire and you’re ready to go!